NEW YORK—The next time you discard a piece of paper containing a half-written love poem, thoughts about your obnoxious next-door neighbor, or musings on the end of the world, know that these thoughts just might end up in print. 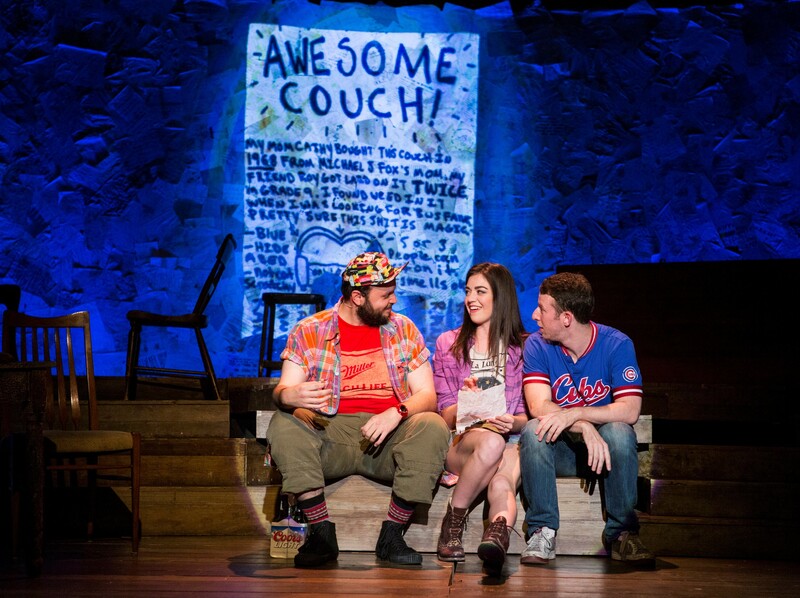 This is the premise behind the joyful new off-Broadway musical Found (book by Hunter Bell and Lee Overtree, music and original lyrics by Eli Bolin). 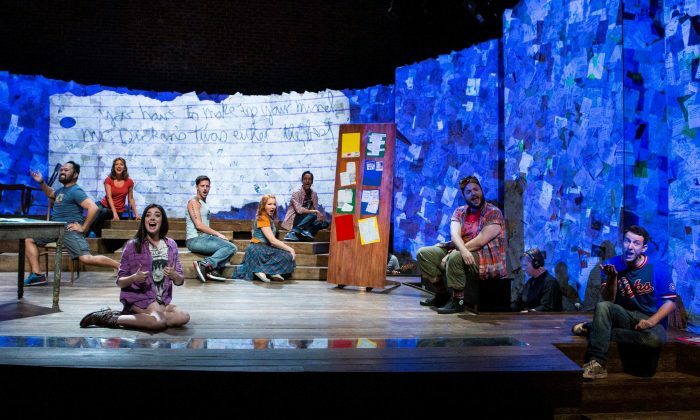 The piece is based on the “Found” books and magazines by Davy Rothbart (additional material created in collaboration with Story Pirates) and is presented by the Atlantic Theater Company. Davy (Nick Blaemire) is having a bad day. He’s been fired from his job, gets mugged on the way home, and finds what appears to be a traffic ticket on his car. However, Davy quickly discovers that the piece of paper is a note, placed on his car by mistake, from an irate woman to her boyfriend. Intrigued, Davy begins noticing numerous other paper messages strewn about the city. Some are funny, some serious, some angry, but all offer brief insights into the people who wrote them, with one’s imagination filling in the blanks as needed. 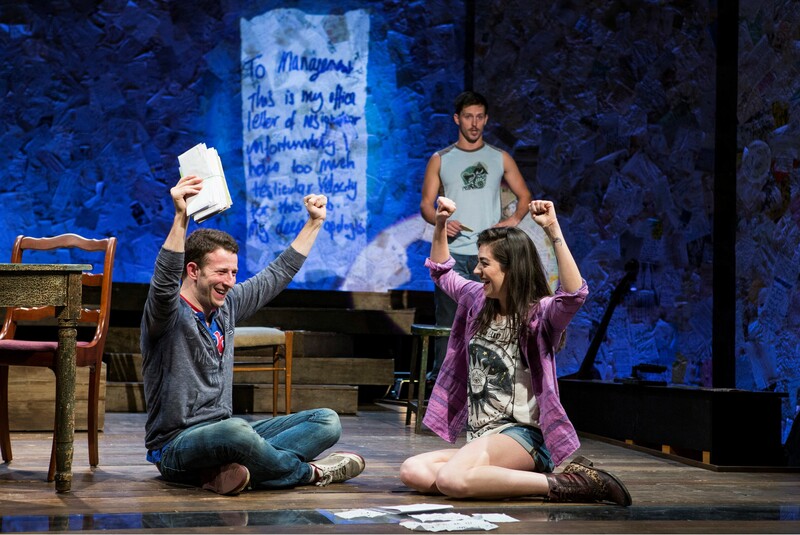 Bringing a bunch of these papers back to the apartment he shares with roommates Mikey D (Daniel Everidge) and Denise (Barrett Wilbert Weed), Davy proposes creating a magazine filled with the messages he found. Needing money to pay the rent and quickly excited by the idea in general, the two agree. Denise uses her contacts as a bartender to help them get a couple of bookings at performance spaces where they read some of the notes aloud and invite audience members to read any they happen to come across themselves. It’s not long before the premise starts to gain an enthusiastic following, with things looking up for the trio. Things change, however, when Kate (Betsy Morgan), who works in the television industry, turns up at one of the performances and hears someone reading the note she herself wrote when she was 10 years old —something about bequeathing her skull. Attracted to Kate, Davy quickly asks her out, much to the consternation of Denise, who obviously has feelings for him. Seeing the potential in the magazine idea, along with a major career boost for herself, Kate talks Davy into going to Los Angeles and pitching the concept as a television series. When network executives see the premise as something along the lines of “America’s Funniest Home Videos,” rather than publishing the notes, warts and all, Denise wants no part of it. Her stance puts her at loggerheads with Davy, who sees this is as a shot at the big time and also as a way to cement his relationship with Kate. “Found” succeeds because of the wonderfully engaging cast, the bouncy score, and the judicious use of the various notes and letters read aloud by the different actors. The messages are both interspersed with the plot and sometimes a part of it. Unfortunately, at times the storyline is a little too much by the numbers, and one can tell what’s going to happen long before it does—not only with the television program idea, but also with the love triangle. Fortunately, the overall experience of the show more than makes up for any shortfalls. 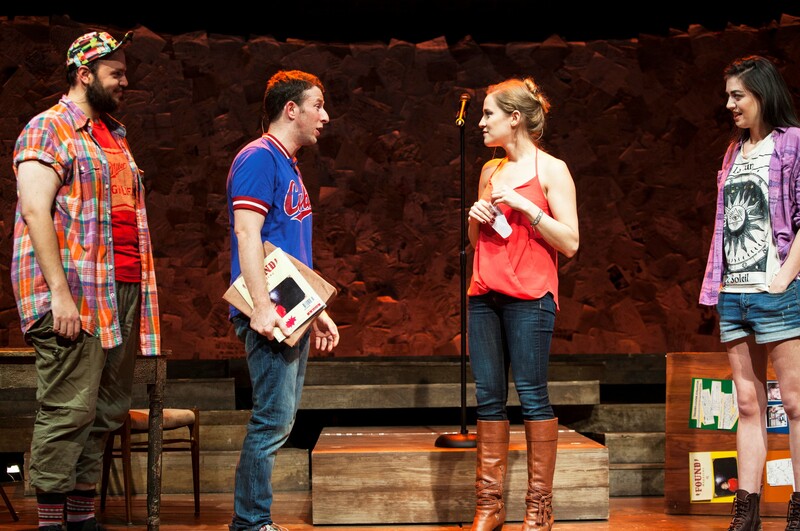 Blaemire is fine as the eager and energetic Davy who initially sees the magazine idea as a sort of catharsis. He is anxious to take it as far as he can go, no matter who his decisions may ultimately hurt. Everidge is great fun as the wisecracking and loyal Mikey D; while Weed is appealing as Denise, a person who’s nobody’s fool and who refuses to let anyone take advantage of her. Morgan is very good as Kate, a driven soul who eventually learns to bend a bit, but who still has her eye on a corner office. The rest of the cast is quite enjoyable, several of them playing multiple roles. Overtree does very well with the directing chores, keeping the story moving quickly and making good use of the notes at key points to give extra impetus to what’s playing out on stage (such as “everybody has problems,” “talk to her”). It also helps that the enthusiasm the cast projects is quite infectious, and you find yourself wanting to see how it will all turn out. Noting that everyone has their own special story to tell, “Found” tells quite a lot of them very, very well. Also in the cast are Christina Anthony, Andrew Call, Orville Mendoza, Molly Pope, Danny Pudi, and Sandy Rustin. Some people might call “It’s Only A Play” a valentine to the theater, but you mustn't believe them. It is always a joy to spend a night at the theater with Tom Stoppard; you can count on sparkling and witty wordplay. At the beginning of the Richard Tucker Gala at Avery Fisher Hall, the late tenor’s son Barry Tucker announced some cancellations.